One of the most wonderful rides in Melbourne is around the bay, west of the Yarra River, where you’ll enjoy wetlands, beaches, and views of Melbourne and the bay. The ride commences at Aircraft Station and ends at Williamstown Station. Initially the route follows Skeleton Creek down to Altona Meadows before going along Bay West Trail via Altona and Williamstown. 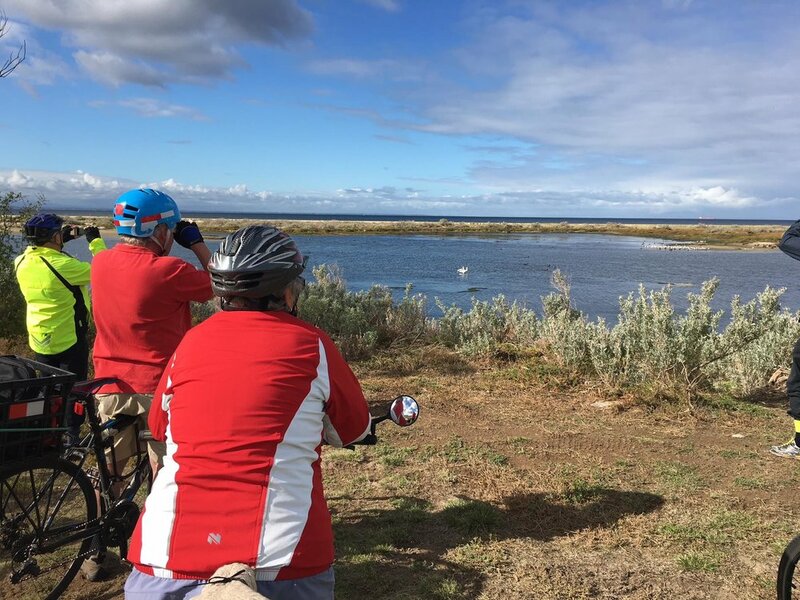 The route passes through several wetlands – Cheetham Wetlands, Truganina Park, Altona Coastal Park and Jawbone Conservation Reserve. There are always birds in the wetlands – swans, ducks, coots, purple swamp hens and pelicans. There are very pleasant beaches at both Altona and Williamstown. On top of the 100 Steps of Federation. Of special interest is the 100 Steps of Federation, a small hill that provides a spectacular 360° view of Melbourne, its mountains and the bay. Soon after this you cross Laverton Creek in Truganina Swamp. In the warmer months, this creek may be teeming with waterbirds including migratory waders such as greenshanks and royalspoonbills. If you are lucky, you may even see an orange bellied parrot. Just after Laverton Creek keep an eye out for the Old Government Explosives Reserve and the old tracks from which explosives were loaded on to boats. As you approach the refinery in Altona Wetlands, look for the statue of Phar Lap. There are cafes and toilets in Altona and Williamstown. The ride is mostly along bike paths, and is mainly flat. Riding along the beach at Altona. The ride starts on the south side of Aircraft Station. Head west along Railway Crescent to the roundabout intersection with Pt Cook Road. Turn left onto the footpath on the left of Pt Cook Road and staying on the footpath, cross the M1 Freeway. At the next roundabout stay on the footpath and turn left onto Central Ave. Follow Central Ave to Ailsa Street. Turn right into Ailsa Street and follow this until you reach the Skeleton Creek Trail. Follow the creek along the trail to the end of the houses. At the junction near the sculpture, “H2O Stint Map”, turn left onto Bay Trail West. Follow Bay Trail West ignoring any left turns and take the first right turn to stay on the trail. Continue on the trail until you see the steps on your right. This is the 100 Steps of Federation. After admiring the view, retrace your steps to Bay Trail West and turn right. Continue on Bay Trail West to the Laverton Creek and cross the bridge. Turn right to follow Bay Trail West to Altona Pier staying as close to the beach as possible. Continue on Bay Trail West staying as close to the coast as you can passing Altona Beach, Altona Safe Harbour and the dog beach to reach Altona Coastal Park. Turn right just after the Trail leaves the coast, and ride around a long bend before turning right again to cross the causeway across Kororoit Creek. Turn right to follow Kororoit Creek downstream. After passing various anglers’ clubs, the trail turns inland along Maddox Road. Turn right just before Kororoit Creek Road. The trail continues through Jawbone Conservation Reserve until it reaches Victoria Street. The trail turns right on Victoria Street and then immediately left. Ride on the shared path alongside The Esplanade. It passes Williamstown Beach and continues around the point until it is parallel to, and on the beach side, of Battery Road. Continue until you reach a pedestrian crossing. You should see the Williamstown Station in the distance on the left. Cross at the pedestrian crossing to head onto Railway Terrace. There is a park on your right. Ride up through the park to the right of Railway Terrace to Williamstown Station. finishing at Altona. Just head straight up Pier St from the pier for a few blocks to find Altona Station. finishing at Williamstown Beach. After passing the surf lifesaving club, the baths and the kiosk ride up Forster Road to its end where you will find Williamstown Beach Station. Melway or Melway Online: Starts at map reference 53 B11. Note that there are two map errors. Map Gap 1: There is a couple of metres of trail not recognised by Google. Map Gap 2: Here Google will not take you across the road to go to the station.